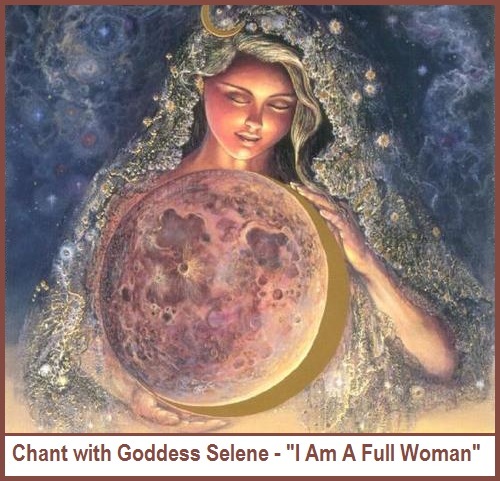 Selene, Goddess of the Full Moon, is a Titan – the generation of Greek divinities that ruled prior to the Olympians. She is called Luna by the Romans. Selene is depicted as a woman riding side-saddle on a horse, or in a chariot drawn by a pair of winged horses. She wears a crown with the lunar sphere or crescent on it, or has these moon images on her cloak. Author Jean Shinoda Bolen writes the following in her book, Artemis, the Indomitable Spirit in Everywoman: “With the description of Selene as the full moon incarnate, I was struck with the realization that it was her fullness as she is that needs emphasis.” I agree with the author when she also shares that a woman’s maturity brings qualities of her passions, dedication, and perseverance to the place where a woman can say, “I Am A Full Woman”. This affirmation appeared in Rachel Bagby’s (award-winning artist, author, composer) dream when she was feeling anything by full. It was a healing song for her. Since then it has been so for countless other women, who dance and chant, ”I am a full woman, I am a full woman”, and take this message to heart. 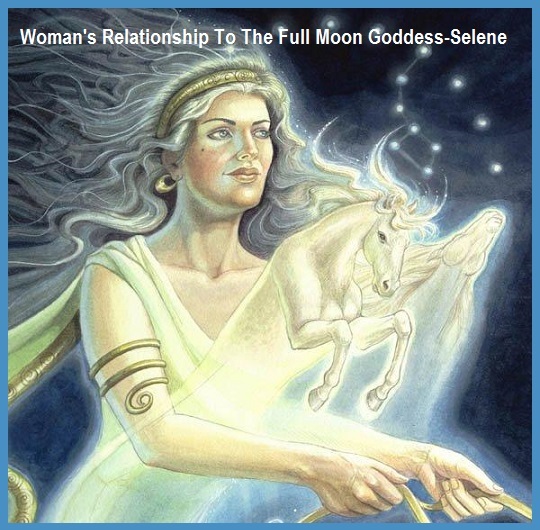 What can we learn from Selene’s Archetype – The Lover? The Lover Archetype represents passion and selfless devotion to another person. It also extends to the things that make our hearts sing, like music art or nature. The shadow aspect is obsessive passion that completely takes over and negatively impacts on your health and self esteem. You may be drawn to this stereotype if you are looking to attract a new lover or to re-ignite the fire in an existing relationship. The Lover can also be a useful tool to discover what you are passionate about in life. On the shadow side you need to ask, whether the energy and time you are putting into relationships, or enthusiasm for projects is excessive? If this continues for too long you are likely to suffer from stress and physical ill health. Ixchel (pronounced EE-Shell or ISH-Chell) has been revered since ancient times as the Mayan Moon Goddess and Medicine Woman. 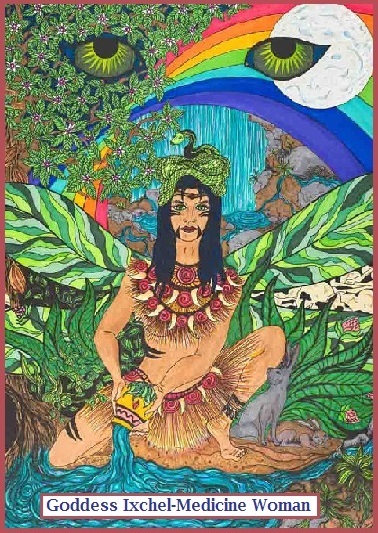 As an embodiment of the moon, Ixchel is intimately connected to the tides of water and controlling rain. She is also called Lady Rainbow, as her essence is infused in water-droplet prisms that create rainbows. Ixchel is also a mother goddess that helps with fertility and childbirth. Finally she is a powerful healer and can connect you to your foundational roots as a spiritual healer. 1. “Commanding power is not the same as demanding it. Demanding comes from a childlike place akin to a tantrum, based on fear that it might be withheld. Commanding is based upon the sure and steady knowledge that you are part of the Great Spirit’s grace and wisdom. 2. You’re a lightning rod that can conduct the power. Simply connect to the power through unyielding clarity of your thought processes. Don’t waver for a moment in your sure and steady decision to be a conduit of the power that already resides within you. Romi Kumu is the Goddess of willpower and was a major goddess to the Baransama people. Her main following would be people from South America. 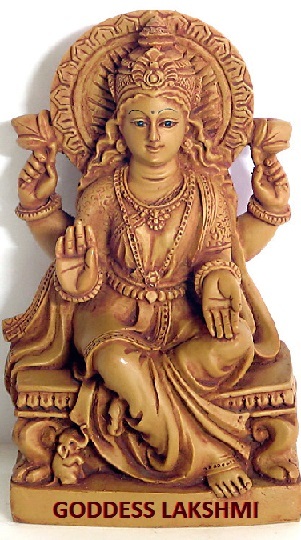 It is believed that she is the Great Mother and that she created the world and everything in it. This includes the Underworld. 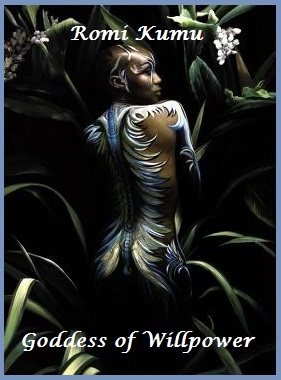 This South American Goddess of Creation is strongly connected to the Rainforest and Tigers. Her sacred stone is the bloodstone, which is the symbol of the warrior. Which suits her well considering she is a strong, powerful, and aggressive goddess. You need to feel the strength you have within and use that power to materialize that which you want. Feel Powerful! When you can look at your own needs and desires for happiness, you will discover that you can better bring change and happiness to the people you love and to yourself. Your happiness is not exclusive of theirs. You will embark on a journey of self discovery. 1. To get your way, tie a red scarf around your head or wear the color red in some way. 2. Light a red candle to represent the fiery nature of your desires and a pungent stick of incense to carry your words through the air to all the world. 3. Make a fan by folding a rectangle of red paper over and under several times. On the folds of this fan write these words: Strength of heart, strength of will, can my dearest dreams fulfill. Fasten the fan with a paper clip and firmly wave it through the incense smoke to intensify the aroma. Say the words you have written on aloud one time for each fold in your fan. 4. Place fan under your pillow to empower strength of will. Try “lucid dreaming” as you fall asleep. Remember that it is your dream, and you can will it to turn out the way you want. This is reinforcing the fact that you have the power to control your life. The Great Goddess of Willendorf, Austria, is among the oldest artwork we have from the Paleolithic Period dating sometime between 28,000 and 25,000 BCE. Author Hallie Iglehart Austen in her book, The Heart Of The Goddess, describes this figure as the all-encompassing Great Goddess. 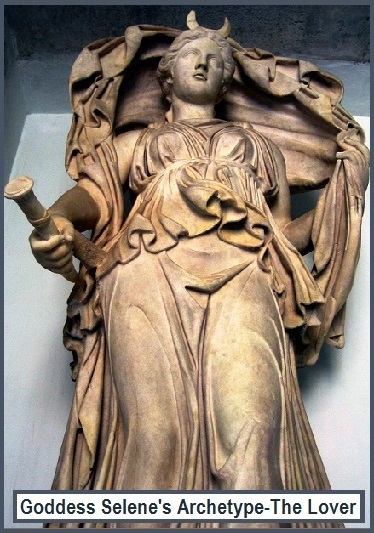 The author writes this statue is a woman’s faceless, egoless primal Self, peaceful in her body and her miraculous power as Woman and as Earth – to create (MOTHER OF US ALL). 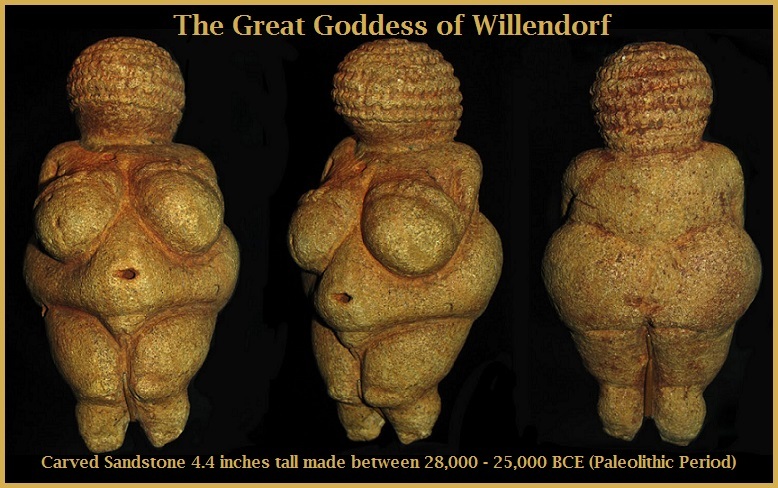 Over 90 present of human statues found from 30,000 to 5,000 BCE were females much like The Great Goddess of Willendorf shown above. 1. Set up a sacred place for Goddess Meditation. Visualize actually being in the presence of this Great Goddess. 2. 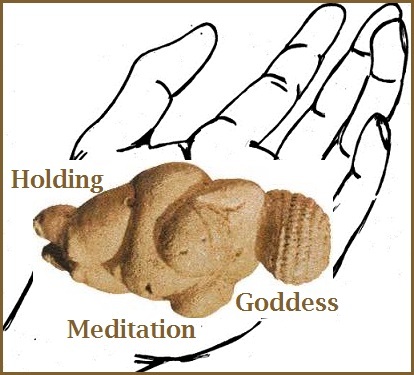 If you don’t have a small Goddess figurine, imagine the small round shape fitting easily into the palm of your hand. It is a reminder of our source of the Sacred Feminine. 4. O Great Mother, mother of us all, oldest of the old, come to me through the labyrinth of time to help me remember the wisdom of my forebears, the eternal life-giving power of a woman. 5. It is important to remember mothering is a powerful image for all acts of creativity and nurturing. The Great Goddess is available to us, she is one with us. We just need to believe. 6. 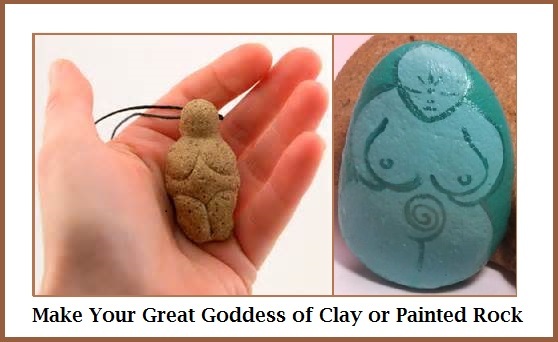 To continue this meditation exercise you might want to create your own Great Goddess. Have fun! Studying Goddess Mythology is rather new for me. 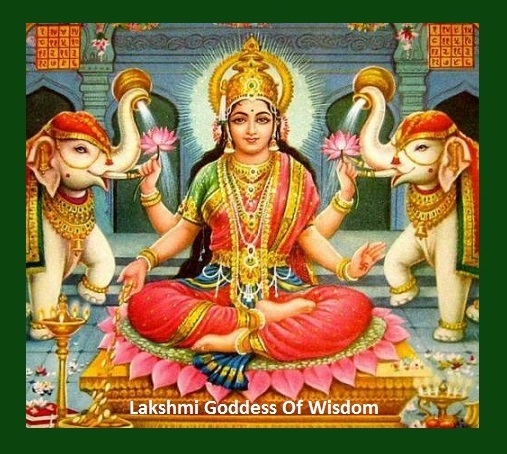 However, I have found that many women are becoming more drawn to the feminine energies surrounding many of the world’s Sacred Goddess Centers. I certainly felt the Earth’s or Goddess’s feminine energy at the Minoan Ruins. Today lets focus on how to feel and believe in our Goddess within. In the book, Goddess Bless! Divine Affirmations, Prayers, and Blessings, author Sirona Knight guides the readers on how to create affirmations to contact the Goddess you need, when you need her. 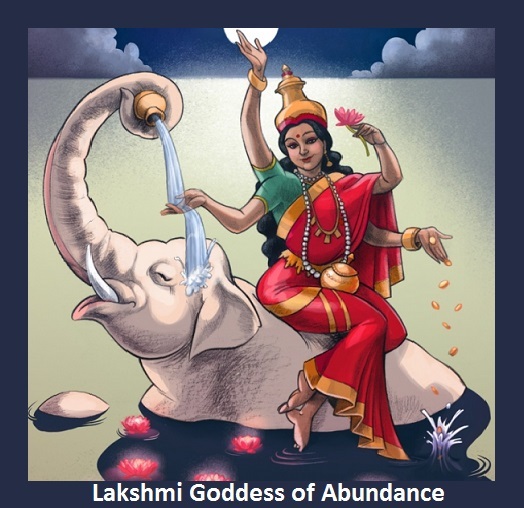 The author recommends a simple formula for creating Goddess affirmations. You can customize your affirmations to fit your personal situations or specific issues. She suggests begin with a basic phrase consisting of one or two lines. Keeping it short and to the point, makes it easier to remember for repetition. the Goddess flowing through me. the Goddess filling my body, mind, and spirit. make the best choices possible. To make your affirmations more successful, consider setting up a sacred space for doing them. Pick a place that is out of the way and private. It doesn’t have to be anything elaborate, but where you feel comfortable. It is nice to place an image of a Goddess or something that represents her such as a favorite rock, flowers, or a special photo. 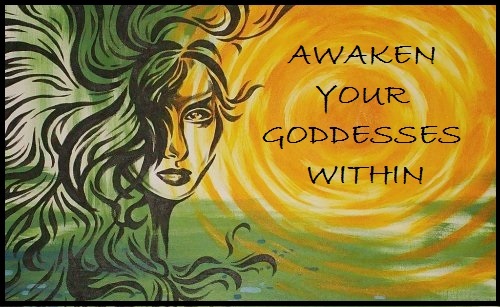 Enjoy creating your own affirmations and Awakening your Goddess Within. The first day of my Crete pilgrimage, Carol Christ, Ph.D, lectured and guided the group through the Minoan Civilization Section of the Heraklion Archaeological Museum. We were then taken to our first Minoan Ruins to visit. Knossos was undeniably the capital of Minoan Crete. Knossos was inhabited for several thousand years, beginning with a neolithic settlement sometime in the seventh millennium BC, and was abandoned after its destruction in 1375 BC which marked the end of Minoan civilization. 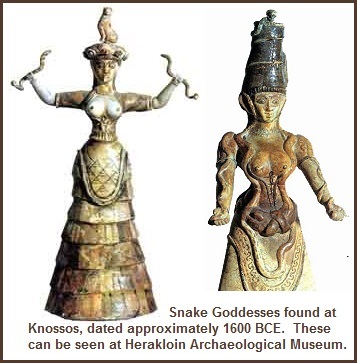 The two famous faience (glazed ceramic) Snake Goddesses were found in the Knossos Ruins. Snake Goddess had a broader function of Universal Mother or Earth Mother and was thereby principally a fertility deity. The Phaistos Disc is an enigma and the most important artifact found in 1908, at Phaistos, the ancient Southern Crete Minoan Palace. It is a circular clay disc inscribed with symbols stamped on both sides that are unlike any signs in any other writing system. The disc is thought to date from around 1700 BC. The text consists of 61 words, 16 of which are accompanied by a mysterious “slash” mark. Currently, it has not been deciphered. My favorite Sacred Center was the Palace of Malia. The site was inhabited in the Neolithic and early Minoan period (6000- 2000 BC), but very little trace remain. The first Palace was built in 1900 BC and destroyed in 1700 BC when a new Palace was built. Following the fate of the other palaces in Crete, it was also destroyed in 1450 BC and the present ruins are mainly those of the new palace. The Palace of Malia is situated on the North coast of Crete, East of Heraklion. To the south lie the Lasithi Mountains. Little is known of the Old Palace though some finds from this period attest to its wealth. The Bees Pendant below is one of the most famous exhibits in the Heraklion Archaeological Museum. It’s a very detailed representation of two bees carrying a drop of honey to their honeycomb. It was found in the Old Palace cemetery at Chrysolakkos, outside Malia Palace. Bees were very important in the Minoan, matriarchal civilization. As a symbol of the Mother Goddess, bees represent mutual support and fertility. 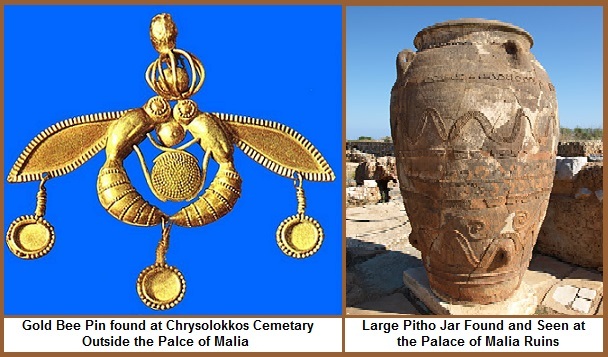 The large Pitho Jar was another artifact found and is on Malia Ruins site. These oversized jars were used for storage of foods, grains, olive oil, and possible wines. Walking on the grounds of these Sacred Centers was the most fulfilling feminine energy empowerment I can truly remember. 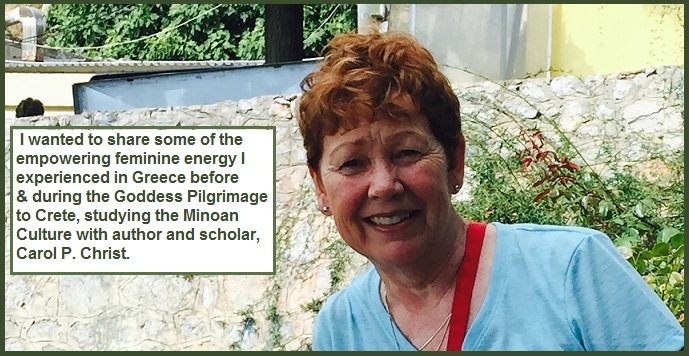 If you want to know more about the women’s Goddess Pilgrimage and the Minoan Culture, please check out www.goddessariadne.org. I was fortunate to have two days in Athens before meeting on the Island of Crete. There were four of us pilgrimage sisters that met for the first time in Athens and traveled together to Delphi Ruins (510-323 BC), which is known for the Pythian Games or the precursors of the modern Olympics. 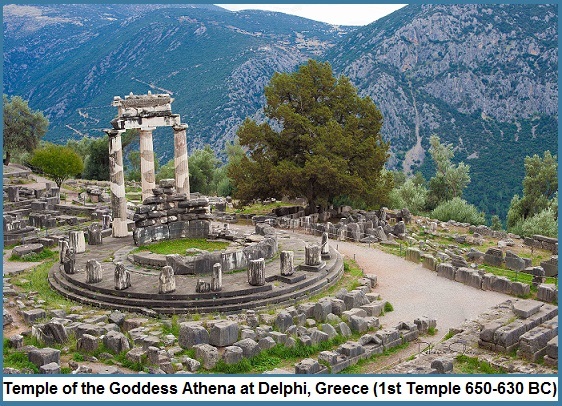 However, I learned Delphi was labeled the “omphalos” (navel) of the earth, or the center of the world. Where I felt strong feminine energy was spending quiet time at the Temple Ruins of the Goddess of Athena. To walk amongst those enormous stones, feel the space being wrapped in the womb of the mountain, was spine-thrilling. I invite you to imagine joining me and visualize the feminine spirit, as we gaze at this photo of the amazing ruins and surrounding mountains. You possibly can feel the heat penetrating your skin and energy rising up through the soles of your shoes. Believe me, it did feel like we were at the navel of the center of the World. The trip to Delphi was a 11 hour round trip from Athens. I only had part of the next day to visit Acropolis which fortunately was within walking distance. My friend and I got up the next morning and was at the gate at 8 a.m. The Parthenon served as a temple to Athena. This was considered Sacred Grounds of Greece. What was so moving was seeing Acropolis at night from the top of our hotel. There something so magical about this ancient city that raises above today’s Athens. It is impossible not to feel the energy of this magnificent ruins. One of the most important roles that Oshun plays is that of the goddess of the sweet waters and the protective deity of the River named Oshun in Nigeria. 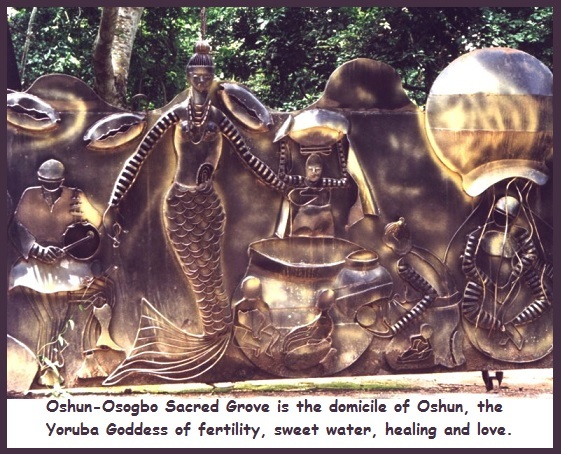 Alongside this river is a sacred grove, probably the last in Yoruba Culture, dedicated to Oshun. Sometimes she is portrayed as a mermaid, with a beautiful tail of a fish (as seen above). As a goddess of love, Oshun is depicted as a beautiful, charming and sensual young woman. Although Oshun governs love and the sweet waters, she is also regarded as a highly benevolent deity. She is said to be the protector of the poor and the mother of all orphans. 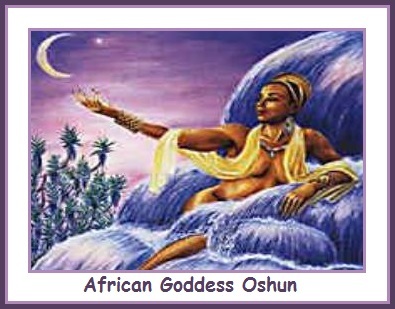 Oshun is regarded as a healer of the sick, the bringer of song, music and dance, as well as prosperity and fertility. She is known to teach the art of divination using cowrie shells, as well as songs, chants and meditations taught to her by her father Obatala. After researching this lovely African Goddess, I am wondering if visiting the following festival might need to be added to my bucket list. 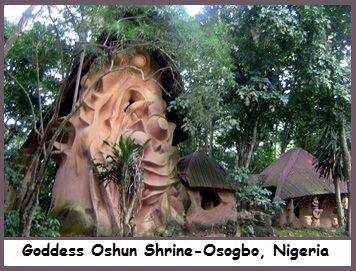 The festival of Oshun-Osgobo, which takes place every year in Osogbo, Nigeria, celebrates the goddess of fertility, Oshun. The festival renews the contract between humans and the divine. Oshun offers grace to the community; in return, it vows to honor her Sacred Grove. This ceremony is part of a rich indigenous Yoruba religious tradition that began in West Africa and has become one of the ten largest religions in the world, with upwards of 100 million practitioners. Very little is known about ancient British goddesses, although one of the most important was unquestionably Elen of The Ways. She is to be experienced, not to be read about. She is an antlered goddess, her antlers showing her free nature spirit. Her hair is long and red, often entangled with twigs and leaves. Her white limbs glows in the shadows and shine in the moonlight. Her green eyes, full of mischief, hold the secret of the Ways. 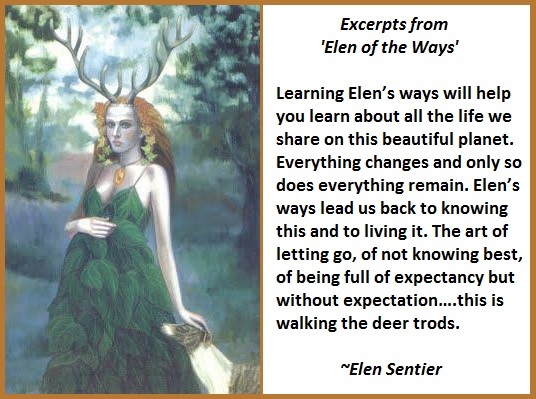 Author, dream explorer and teacher, Robert Moss, says, “Elen is Lady of the Ways in many senses. 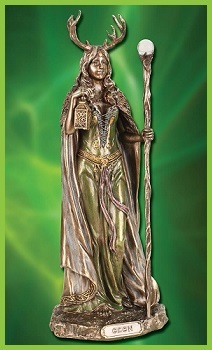 Most significant, for me, is her role as Lady of the Dreamways.” She has a strong link to Shamanism, as a goddess that will guide during spiritual path-working and journeying, as well as the physical journeys we make. She is a goddess that “walks between the worlds” (Caroline Wise). Robert Moss shared the following about a possible dream visit from the Goddess: British visionary artist Chesca Potter says that when she moved to London, she had a vision of an immense goddess figure, dressed in green and gold, over the church of St Pancras. She painted and sketched several versions of this antlered goddess. 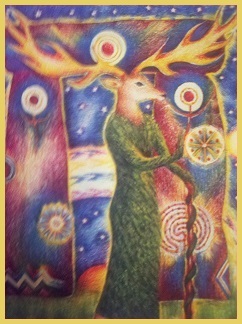 The one shown here, appears on the card labeled “Lady of the Ways” in John Matthews’ Celtic Shaman’s Pack. Do you have a desire to call on Elen? I Do!